Welcome to Day #1 of Chocolate and Halloween Cocktail Theme Week. I admit it, we're devolving into less and less serious territory by the week here in October. But, it's Halloween. 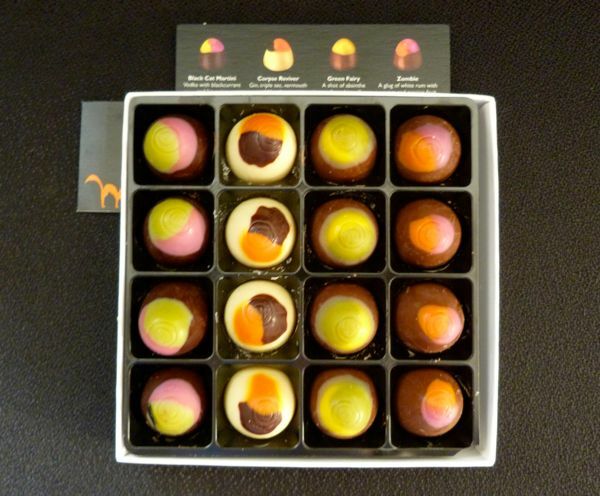 I ordered a box of "Choose Your Poison" Halloween cocktails with a shot of liquor, from Hotel Chocolat (UK). This spooky assortment of chocolate cocktails included the Black Cat Martini, Corpse Reviver, Green Fairy and the Zombie. What do I love about this company? Their creative and original chocolates, classy packaging—and the thought that I might one day visit their hotel and plantation on the island of St. Lucia. 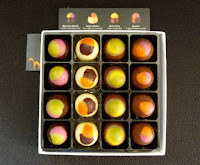 Today I had all 4 Zombie* chocolates. 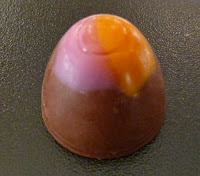 And they did indeed taste like tiny boozy zombies—if zombies had creamy centers and were covered in chocolate. Fortunately, I wasn't planning to drive anywhere this morning. 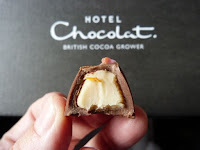 *Hotel Chocolat describes their Zombie chocolates as having "a glug of white rum with orange and passion fruit.